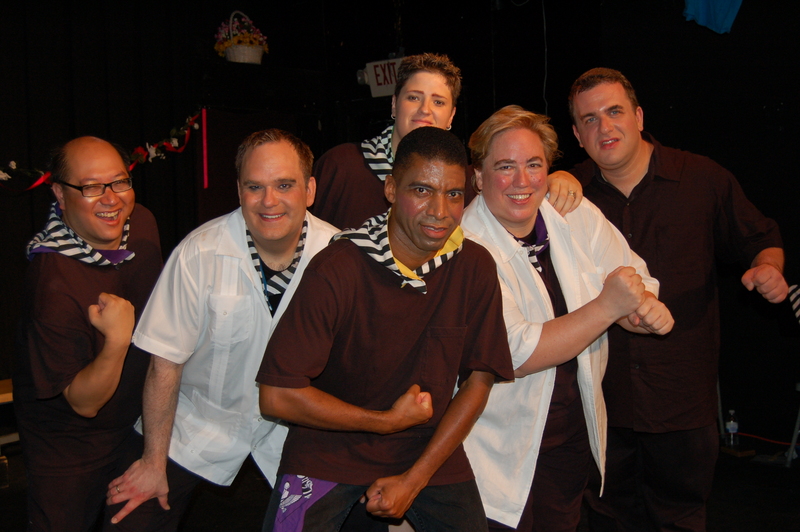 The roots of this enduring partnership rest in a successful run that the Lesbian & Gay Chorus of Washington, D.C. (LGCW) created with a truncated version of Iolanthe, Regina Carlow Music Director, in the mid 1990s. So much fun was had that there was an urgent need to continue the frivolity. The key to the LGCW’s success was an irreverence for politics-as-usual (shared with Gilbert), a bit of updating, and a gender neutral perspective when it came to casting and dialogue. We cast a second tenor as the Fairy Queen in contrast to a contralto in the waning of her singing career. The fairies were a mix of soprano and bass voices, the dukes tenors and altos, and so on. These changes were so easily accomplished, we wondered, could it be that Gilbert himself might actually have anticipated something of this sort happening? Of course, we’ll never be able to say one way or another. In historical context, it means one thing for Lord Tolloller to say to Lord Mountararat: “You are very dear to me, George. We were boys together – at least I was. If I were to survive you, my existence would be hopelessly embittered.” From our modern perspective, it is easy to take the same words and realize a different sort of relationship for Lord T and Lord M.
I had been the stage director for LGCW’s Iolanthe (the source of Lord T and Lord M above) and, armed with this one credential (I was a fledgling director at best), I approached Jeffery Watson who was then the CHAW Executive Director about CHAW becoming home to a summer offering of Gilbert & Sullivan; Jeffery agreed, and so the partnership began. Since the GLBT Arts Consortium network offered a wider network of arts organizations where potential singers might be found, the Consortium became CHAW’s partner. CHAW is the perfect setting because it attracts teaching artists, artists, and people who want to revisit the arts or challenge themselves to explore the arts in a new way. The fun has been contagious. This summer marks the 11th production! Perhaps I was doomed from the start because in my home when my father asked my mother what was for dinner, she would often respond, “Why who are you who asks this question?” Although it was a bit later in life that I learned the context for this line (The Mikado), I know that from the age of 10, I yearned to be in a Gilbert & Sullivan operetta. When left alone in our house in Lahore, Pakistan in the late 1950s where my parents were serving in the U.S. Foreign Service, I found these mysterious albums with little books (aka, librettos) filed together near my father’s hi-fi. I pulled them out and listened to them one by one, identifying my favorites (The Mikado — an early choice) and following the words when I wasn’t up and dancing to the music. These albums brought me hours of delight and my vocabulary blossomed, adding: abject, asperity, impunity, felicity, parsonified (one of Gilbert’s words created to make a rhyme with matromonified), conjugally, and so on. As one learns the lyrics, one finds them creeping into one’s conversation. One can burst into song at the announcement of good news: “Oh joy oh rapture unforeseen!” or state thoughtfully, “Modified rapture!” Or opine wisely when hearing of an egregious lawsuit (a million dollar lawsuit for a missing pair of pants, for example), “The law is the true embodiment of everything that’s excellent.” Half the fun is the numerous, unexpected applications to every-day living. 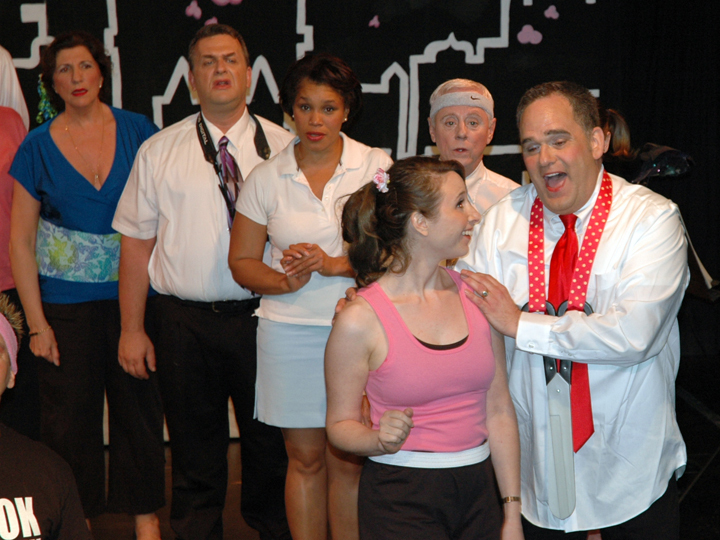 Ko-Ko (Dean Reichard) assures Yum-Yum (Jennifer Weingartner) that they'll have a happy marriage (The Mikado). 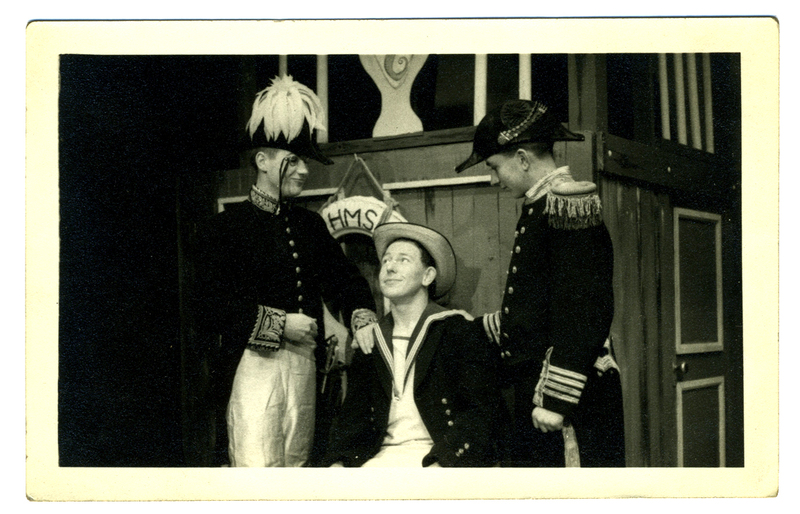 It was positively life-altering (well, I was a kid) to discover that my British father Alan and his two siblings had their own connections to Gilbert & Sullivan. Following her divorce, my grandmother, their mother, had dated a chorus member in the D’Oyly Carte Opera Company. To curry favor with my grandmother, this suitor had often given my father and his siblings tickets to Saturday matinees at the Savoy Theater. Later on, a Strachan family gathering involved singing through the Gilbert & Sullivan song book with Aunt Molly at piano and singing alto, my father singing bass, Uncle Stuart singing tenor, and I singing soprano, joined on occasion by mother Evelyn and my sister Heather. This scenario was repeated in many other locations around the world with different personalities weaving unlikely threads of connection – I must mention, most notably, my friend Joan Biella (we first met in Egypt in the 1960s) who now spends her summers producing the costumes and props for the CHAW/Consortium productions. Her parents (dear friends of my parents) met during a college production of The Mikado. It seems that we haven’t been able to help ourselves (a reference toIolanthe), so we have tackled 7 of the operettas, choosing from the more familiar, and now offering repeats. Over the years, some things have changed for our productions. Dancer Alvin Mayes was the choreographer for the first nine shows. Our Music Directors have included: Scott Barker, Paul Heins, Lenard Starks; Barbara Schelstrate has been with us for the last three productions and is joined by Peter DiMuro (for the second time) as the director/choreographer of Pinafore. Our singers now hail from all over the DC metropolitan area and have even drawn international notice. For two summers, the cast included an Indonesian tenor Dani Dumadi whose wife was posted at the Indonesian embassy. Dani struggled a bit with the Englishness of it all, but pulled through handsomely with two notable performances as Frederick (The Pirates of Penzance) and Strephon (Iolanthe). Twice, a major catastrophe of illness and accident has threatened the show! Both times, we were able to replace the tenor (what is it about tenors?) with an actor to read the lines and a singer to sing – creating a dual character of sorts which in both cases the audience loved. Last summer, when this happenstance occurred, Peter DiMuro became the spoken Nanki-Poo and Paul Heins sang from the orchestra pit and played flute when his vocal talents were not needed. Casting has also changed. Where once the cast was drawn almost exclusively from the glbt community, it now attracts a wider population reflective of our more accepting, changing culture. Cast members come from all parts of the metropolitan area. They still represent a wide range of vocal and acting skills including professionals (Soprano Jennifer Weingartner has sung the lead soprano role for Iolanthe, The Mikado, and now Pinafore) as well as folks who are trying this singing/dancing/acting gig for the first time. In the course of the three and a half months that takes us from initial rehearsal to final production, the cast and production crew become a working, thriving community. The coalescing of community is recognized at the moment each summer when I am asked what we will be doing next summer! The Gondoliers are ready for whatever life holds. (2006) . Early on, I had the satisfaction of being an orange fairy in Iolanthe, but have since become quite content to sing along in rehearsal and apply my talents to producing and learning about directing from such pros as Alvin, Barbara, and Peter and witnessing the evolution of cast members. True confession, however, the pinnacle of my thespian career occurred when I delivered the spoken lines for the disabled tenor at the time of our first calamity. Possibly, I’ve never had so much fun as I did that evening! Directors hold a larger vision of not only what will look good, but how to get folks to achieve the vision. A formation for a song becomes a re-creation of the Union Jack stripes. And, who knew there were so many uses for umbrellas! They protect, they cover, they scare, they add color, they emphasize — their mere opening causes people to laugh. It is fascinating to watch the rehearsal process; it is somewhat torturous at the beginning when the woodshedding for the music and dialogue is the focus. There is lots of coaching, emphasis on how to say a consonant or syllable, repetition and clarification – the directors have an enormous amount of patience as they seek the best result. Choreography and blocking become foci (although one must always sing correctly) and each scene is broken down to its minute parts. As the music begins to enter the bones of the cast members, the ability to move is enhanced, and things begin to pop on stage. A cast member takes a risk; or perhaps, more accurately, something happens naturally as he/she sings and that gesture or expression becomes part of the tableau. 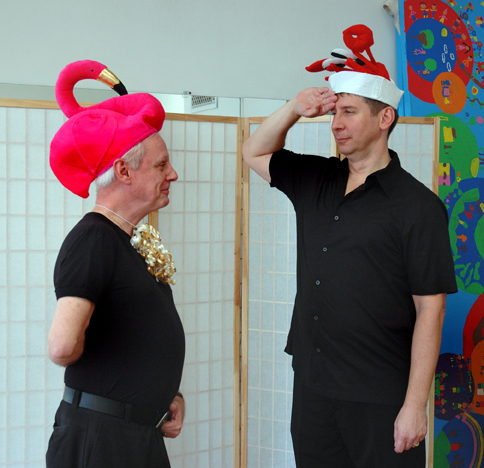 When freed, actors create another whole which can only be hoped for at the first rehearsal. It takes skill, knowledge, courage, and patience on everyone’s part to get to the final production and to be able to enjoy the result. Our audience has been enthusiastic in its response, filling CHAW’s black box theater for each performance, laughing when expected and when not expected, clapping heartily, and generally expressing the good cheer that is the deserved reward for the cast that has worked so hard. We particularly love the Savoyards who arrive (usually in a group) and sit in the front row. They wait for the gags and sing a long without much restraint. Recently, I had the distinct pleasure of seeing Oklahoma! directed by Molly Smith at Arena Stage. Oklahoma! had also been a favorite of mine as a kid, but as I grew older, I found myself more and more aggravated by the plot and the romantic clichés which just seemed old-fashioned and hard-to-take. Smith’s perspective which is anchored in gender-neutrality restores Oklahoma! to the modern world without making the production “politically correct.” The thread of this perspective is wound throughout the whole production. It’s hard to describe but it felt visible and palpable to me. It was an inspiration and it made me think of how CHAW’s and the GLBT Arts Consortium’s G&S productions have restored these classic operettas to my life — something for which I am truly grateful. CHAWsome on every front! Be sure to catch Oklahoma and come see Pinafore at CHAW. We are grateful for funding from the Capitol Hill Community Foundation and the Bernard Myers Fund for the Performing Arts. One of these Pinafore performers is a current CHAW employee. The first person to correctly identify the performer/employee will receive two tickets to DHS Pinafore. Email megan@chaw.org with your guess!